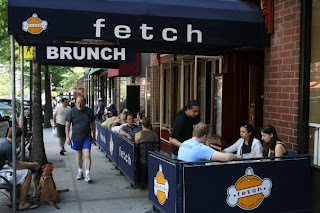 Dining for Dogs (or with Dogs) on the Upper East Side -- Go Fetch! A restaurant themed around dogs? Why not! The kitschy Fetch Bar and Grill welcomes both bipeds and quadrupeds (outside only) with a menu of comfort food that reflects both the season and the chef’s Philadelphia roots. A must-have, Adam’s Philadelphia cheese steak, is served on bread baked in the City of Brotherly Love where the key to its success is the city’s own water (as all good Philadelphians know). Roasted Brussel sprouts are the perfect side to “mom’s meat loaf,” lemon chicken, pastas, and flat bread creations. Tons of photos of dogs adorn the walls of the bi-level pub, creating a cozy space to enjoy the largely comfort-food menu. Sit outside if you want your pooch to dine with you. They’ll give you a bowl of doggy water, too. 1649 Third Avenue between 92nd and 93rd.